Given my developing trend of posting simplicity and productivity information, and reading similar blogs, my stepmom asked about storing cleaning supplies for the different areas of the home. And more specifically, storing cleaning cloths that have been used, but do not yet require a wash. I went through a lot of posts about efficient cleaning, speed cleaning, cleaning tips, and found nothing really useful. But, having given it a lot of thought, I figured I’d post my own ideas. Regardless of the size of your house, unless it is absolutely enormous, you’ll probably have one of two strategies (or a combination of them): a global, whole house strategy and a local, specific area strategy. The combination I envision uses the global strategy on a specific area. The global strategy involves cleaning the whole house as one giant task on one day. 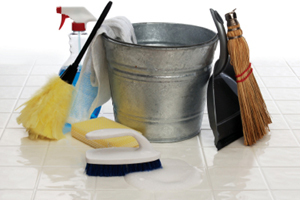 Armed with a cleaning caddy of sprays, rags, cloths, scrubbers, and sponges, you work from top to bottom, dusting or wiping surfaces, then sweeping all the hard floors, vacuuming all the soft floors, and finishing by mopping. Or some similar arrangement. Maybe you break this approach up into one cleaning task or area each day, or every few days (i.e., the combination). The local strategy has specific items stored in specific areas to allow you to clean specific areas when it’s convenient. Maybe you have some dust cloths in the linen closet, or some cleaning sprays and cloths in the bathrooms and kitchen. Even then you probably still only have one broom, one vacuum, and one mop and bucket. You might keep an extra whisk broom somewhere more convenient. In terms of storing cleaning cloths that have been used but do not yet require a wash, I only came up with one idea, and it requires the local cleaning strategy. I can only imagine that locally you have a few clean cloths, you’ve used one to clean the bathroom counter and another to clean the mirror. Now they’ve both been used, they’re wet, but they’re not completely dirty. You didn’t clean every bathroom counter and every mirror in the house. So now they need to be stored somewhere out of the way, but still local: a small towel rod in the same cupboard where the rest of the cleaning supplies are. They’re out of the way, hanging so they’ll dry a little before the next use, and won’t get confused with the clean cloths. On laundry day, wash the hanging ones. If you guys have other ideas, I’d love to hear them. But it really amounts to just two simple strategies, and a small towel bar. This entry was posted in Opinion and tagged housework, productivity.